It has been my goal for several years now to continually challenge myself by bringing home some food item with which I am unfamiliar. I regret to say that it has been quite a while since my kitchen has been graced with any unfamiliar comestibles. 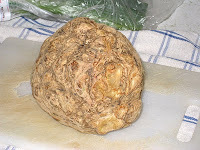 So when I saw the knobby rough contours of a celery root at Treasure Island, I knew it had to come home with me pronto. 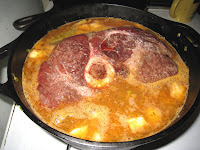 It helped that I had already taken a cut of beef shoulder out of the freezer with the intention of cooking a nice long braise, and I was already thinking carrots, leeks and fennel. The fennel was on the small side and I couldn't decide whether or not I wanted to get two of them or do without, and it was while I was trying to decide whether or not to buy some that my eyes fell on the celery root. I threw it in my cart before I could talk myself out of it. And two fennel bulbs went into the cart as well, of course. The skin is thick and woody, so you definitely want to get rid of it. It's much too thick to use a peeler, so your best bet is to slice off the ends, as I did here. Because this is my first celery root, I don't have a good idea of how fresh it was. It was a little rubbery, but I think that might be one of its characteristics. It actually felt very much like the celery heart, to which it is related. After I cut off the ends, I pared off the skin down the sides, much like peeling the skin off an orange, except that I couldn't angle the knife to follow the curve of the root like I can a piece of fruit. I had to cut down the top half, then turn it over and slice off the bottom half. 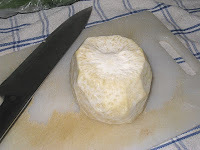 But it did not take long, and it was easy peasy to cut it into a nice chop once it was peeled. I followed my usual procedure for the pot roast. I seasoned the meat well with salt and pepper and set it to sear on a foil-lined baking sheet in a 425 deg. F. oven for 15 minutes. While the meat was searing, I cooked down some leeks, onions, and garlic. 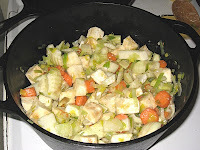 When they were nice and translucent, I added carrots, the fennel, and the celery root, adding more salt and pepper. I let the vegetables cook until the meat was browned. I took the meat out of the oven, turning it down to 325 deg. F., and then I added a generous tablespoon of tomato paste to the sauteeing vegetables. I let the paste cook for a couple of minutes before adding the meat. I nestled the meat into the vegetables, and then I poured water up until it was just below the top of the meat. I added some bay leaves, more salt and pepper, some dried thyme, and a heaping teaspoon of the poudre forte misreall gave me for the holidays. I thought about using wine, or broth, or something with more flavor than water to the roast, but I didn't really have anything on hand and I didn't want to use the rest of my chicken stock. I figured the beef, the vegetables, and the spices would bring flavor enough. I brought the pot to a boil, covered it, and put it into the 325-degree oven. I set the timer for one-and-a-half hours and went about my business. When the timer went off, I checked the pot. It was simmering a little more heartily than I wanted, so I lowered the heat just a little and set the timer again for one-and-a-half hours. When it went off this time, I tested the meat with a fork and when I saw that it was ready to shred off the bone, I took the pot out of the oven. I love how the meat settles into the braising vegetables when it's done. It smelled heavenly and it was all I could do not to serve myself up a generous helping and wolf it down. 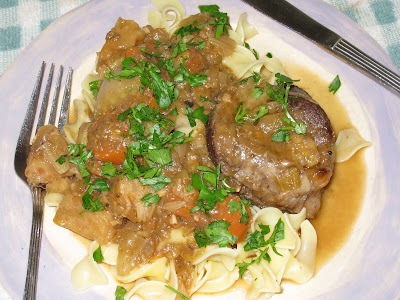 But I had not prepared any starchy side dish (a must for pot roast), and I find that slow braised meats almost always taste better the day after they are cooked. So after admiring it for a little while I took the meat out of the pot and put it in a dish, and then I spooned out all of those luscious vegetables and liquid and put it in another dish. I must confess, I did sneak a taste of the celery root. I was too curious to wait a day to see how it tasted. It is delicious. It has a light, smooth texture and a tastes like a mild, creamy piece of celery. 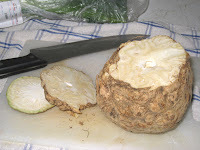 Celery disintegrates when it is cooked; celery root gets soft and smooth, with that lovely root taste. I covered the beef and the vegetables and put them both in the refrigerator. While pondering what side to use, my thoughts turned toward a pasta class I had just attended. While sorely tempted to try my hand at making my own noodles, I decided to wait until I had more time, and opted for some beautiful egg noodles I found at the store the next evening. When I got home the next day, I turned on the oven to preheat it to 350 deg. F. I covered the meat with foil, and put the vegetables, which were already in a covered 3-quart casserole dish and the meat in the oven to heat for about half an hour. I brought some water to a boil and about ten minutes before the meat and vegetables were going to be ready I cooked the noodles. The timer for the meat and vegetables went off just as I was draining the noodles, so everything was ready at the same time. I served up that beautiful plate full of braised goodness you see up at the top of this post. I just happened to have some parsley on hand to make a prettier picture, and it added a little burst of freshness to the flavor. The poudre forte adds a lovely blend of cinnamon, nutmeg, clove and black peppers. Apparently, it was used throughout medieval Europe in much the same way curries are used in India - each household makes their own blend. So if you can't find any, a good substitute would be to start with those four spices I mentioned above and play with them until you get a blend that suits your taste. This is another one of those dishes that is super easy to make but delivers a huge payoff in flavor. It can help keep you warm on these cold winter nights. 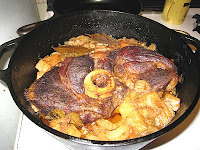 I love to use fennel in my Pot Roast.Great flavor! I love fennel, and celery root, although the first few times I used it with remolade the pieces were too big and it was more of a challenge than a meal. Oh that sounds good, misreall! (The remoulade, not the challenge.) I think I'll have to make that soon.